SAN FRANCISCO, Oct. 11, 2018 /PRNewswire/ -- Skillz, the worldwide leader in mobile eSports, today announced the top performing smartphones among mobile eSports competitors. 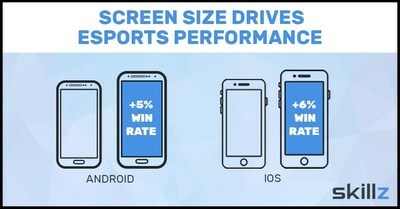 An analysis of over 800 million tournaments showed that people competing on phones with larger screen sizes win significantly more than those competing on devices with smaller screens. Skillz players using smartphones with larger screens win as much as 6% more often than those using devices with smaller screens. While differences of 5-6% may not seem significant to non-athletes, for elite competitors it can make all the difference. A 5% difference was what separated a $100,000 first place finish and a prizeless 12th place in the latest New York City Marathon. "Upgrading from the iPhone 6S to an iPhone X really made a difference," says Jennifer Tu, a Harvard University junior and the 7th highest earning mobile eSports athlete in 2017. "The extra screen space and the better display help me see opportunities in my matches that I might otherwise miss." This Skillz study comes shortly after the reveal of Apple's iPhone XS Max and Samsung's Galaxy Note 9, both featuring the largest smartphone screens in each company's history. The record-breaking display sizes and their connection to the gaming industry were central to both companies' marketing campaigns. Samsung parnered with Epic Games to deliver exclusive "Fortnite" skins for Note 9 buyers, and Apple partnered with Bethesda Studios to showcase "The Elder Scrolls: Blades" on the newest iPhone during the product reveal. "Whether it's having the right bat in baseball, the right racquet in tennis, or the right hardware in gaming, equipment matters," said Andrew Paradise, CEO and founder of Skillz. "With mobile now the dominant gaming platform, eSports are influencing the specifications for the next generation of smartphones and tablets." Hardware developers around the world have taken note of the universal appeal of mobile gaming. Prominent brands such as Razer and ASUS have recently developed phones dedicated to gaming, both featuring screen sizes larger than 5.5". Newzoo's latest study on mobile hardware also recently reported that larger screens improve gaming experiences. The growth of Skillz has been one of the drivers of success for the mobile eSports industry. The company recently doubled its revenue run-rate for the second time this year. The company now runs over 2 million tournaments a day, and has awarded over $300 million in total prizes to the 18 million players on its platform. Skillz, the leading mobile eSports platform, connects the world's 2.6 billion mobile gamers through competition. In 2017, Skillz was named the #1 fastest-growing private company in America by Inc. Magazine, the first eSports company on CNBC's Disruptor 50, and the only eSports company on the San Francisco Business Times Fast 100. Over 18 million gamers use Skillz to compete in mobile games across 13,000+ game studios. Founded in 2012, Skillz is headquartered in San Francisco and backed by leading venture capitalists as well as the owners of the New England Patriots, Milwaukee Bucks, New York Mets and Sacramento Kings. To learn more, visit www.skillz.com.